In 2014, Angelina Jolie directed the amazing Unbroken movie. Unbroken told the fascinating story of Louis “Louie” Zamperini. Louie was always in trouble. That’s when his older brother, Pete, steps in and takes him under his wing. Pete trains Louie to become an Olympic runner. When World War 2 happened, Louie had to give up his dreams of becoming an Olympic champion. He had a war to fight. He left his friends and families to fight against the looming threat. The unthinkable happened when his plane was downed over the ocean. Louie spent 47 days adrift in a raft. When he was rescued from the raft, he was put into a Japanese POW camp where he and other soldiers were tortured by the maniacal Watanabe ‘The Bird’. Unbroken: Path To Redemption takes place after the horrors Louie experienced in Unbroken. Yet the horrors never left Louie. He brought them home and has to fight for his redemption. Louie (Samuel Hunt) was called to fight in World War 2. This changed the direction of his life. He went from a star track runner to a prisoner of war. One who was mistreated by his Japanese captors. Where Louie wound up, he never would have imagined in a million years. He saw himself as an elite athlete. Instead, he became a soldier, a prisoner, and then something else. What’s your calling in life? What do you think your calling will make you? Your calling may take you down a different path than you think. Life has a funny way of doing that to us. We think we’re going to become one thing only to have us become something else. Be ready to have your calling change you. These men did terrible things to you. What are you going to say to them? As Louie returned to Sugamo Prison, he was accompanied by a photographer. This man was meant to catalog Louie’s journey back to his past. One question nagged in the photographer’s mind. Louie had been tortured and abused by these prison guards. What would Louie say to the men who brutally beat him? You’ve had people who have mistreated you in your life. There are people you want to curse out or punch in the nose. These people may have even made your life a living hell. Do you know what you would say to these men or women who have mistreated you? You need to think about how you’re going to respond to abuse and neglect. You discover Louie’s answer to the question later in Unbroken: Path To Redemption. We get Louie’s answer. But you have to have an answer for yourself. Upon arriving home, Louie goes home with his parents and siblings. One of his family members brings out a bag. The bag is full of letters. Over 2,000 letters were given to Louie. All of the letters were from people who considered Louie to be a hero. When Louie heard this, he rebuffed the term hero. He couldn’t consider himself one. He was just a soldier. Those you lead will often see you as a leader before you see yourself as one. They will watch how you act and respond to situations. They will see leadership characteristics in you that you have never seen before. Listen to these people. They see past your exterior and see what you really are. Someone who can lead and show them the way. Don’t discount God’s role in your journey. Father Cardarelli (Miguel Pérez) visited with Louie after his heroic return. Louie was struggling with what he had gone through. Father Cardarelli reminded Louie of a truth that’s easy to forget. God has a role in your journey. You may not see His role or understand why you’re going through what you’re going through. However, God is there and His hand is guiding you. Look for God in your journey. You will find him there. Louie did. You will too. Louie’s brother Pete (Bobby Campo) saw the best in others. He was always looking for people’s talents and their best side. He saw the potential in Louie. Knowing who Louie was, Pete saw Louie could become a world-class runner. He was right. It’s a responsibility of a leader to look for the potential in others. You may have hired Kimmi to be your receptionist. But could she be something more? What potential does Kimmi have? Look at her skills and ambitions and see where she could move up to. Help her see her potential. You can help people reach higher heights than they ever imagined. All you have to do is look for their potential. Louie was haunted by The Bird. He saw The Bird in his sleep, in crowds, and around corners. Louie couldn’t escape from his tormenter. He chose to cope with his suffering by turning to alcohol. Louie became a drunk. This almost destroyed his life. Leadership will have its ups and downs. You’re going to see some really bad stuff. And you’re going to have to process what you’ve led through. Make sure you’re coping the right way. Get professional help. Seek out a wise friend. Choose to get better. In Unbroken: Path To Redemption, Louie found a wife. His wife was Cynthia Applewhite (Merritt Patterson). They quickly fell in love and married. Because of his drinking, their marriage suffered many hardships. Almost ending their marriage. In one scene, Cynthia tells Louie she is there for him. She wasn’t there for the officer or the hero. She was there for Louie. Louie saw himself as an officer or hero. He rarely saw himself as he was now. Cynthia did. Our identities can easily get wrapped up in the title of leader. You put the title on day in and day out. Everyone sees you as the leader. Still, there is more to you than your title. You have dreams that go beyond that of a leader. Don’t forget you’re more than a leader. You are a person. Louie finally broke down and went to see a doctor at the Veteran’s Hospital. The doctor shared with Louie he wasn’t alone. There were other officers having trouble sleeping, just like Louie. While he thought he was alone, he wasn’t. There were plenty of others like him. 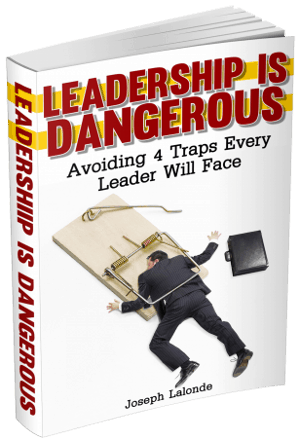 You may think you’re the only one struggling with the weight of leadership on your shoulders. You see the happy, smiling faces of coworkers and competitors. They seem so happy. They’re not. They’re just like you. These people are struggling. They carry the same weight. Don’t believe the lie that you’re alone. If you’re going to train for the London Olympics, you gotta do it right. Cynthia knew Louie wanted to run again. He had begun training barefoot. This training tore his feet to shreds. Seeing this, Cynthia went and got Louie the right equipment. She purchased a pair of running shoes for her husband. Having the right equipment can make your job a lot easier. It can also make the jobs of those you lead a lot easier. Make sure you’re equipping yourself and others with the equipment they need to get the job done. You might be surprised at how much more productive they are when they have the right equipment. Louie began a rigid training regimen as he prepared to run in the London Olympics. As he was racing on a dirt track, there was a crack in his ankle and he reinjured an old injury. Cynthia saw this and realized something. The training had been too much. They were pushing Louie too hard. You may think you have to be extremely hard on your team. Toughness is the only thing they’re going to respond to, right? This is the mindset of many leaders. They crack the whip and lay down the law. All this does is demotivate your team. They believe nothing is good enough. Be careful in how hard you push your team. They do need to be pushed. But, pushing too hard, will do damage too. The behavior of Louie greatly concerned his wife. She felt pushed into a corner. She wasn’t sure what she could do. What she did know was that she couldn’t save Louie. Especially on her own. You can’t lead alone. Regardless of how smart you are or what awards you have won, you are not the Lone Ranger. Make sure you have a great team surrounding you. Find people who will hold you up and hold you accountable. There was a secret Louie didn’t know about. Cynthia was pregnant with their first child. Cynthia was scared to tell Louie this. Her fear was for multiple reasons. Louie didn’t have a job. He was drunk all the time. He could even become violent. Her fear drove her to withhold vital information from Louie. If your people are scared, they’re holding back information from you. They may be scared you’re going to fly off the handle for a mistake. Or they may think you’re going to blame them for something a customer did. Using fear to lead your people won’t work. You won’t get the information you need and their performance will suffer. As Louie fell deeper and deeper into his addiction to alcohol, there weren’t a lot of people in his life willing to tell him the truth. His wife was one of them. His brother Pete was another. He called Louie out on multiple occasions. He wouldn’t let his brother become something he was not. Leaders especially need a truth teller in their lives. They need someone who’s not scared to examine their lives and let them know if they’re off-track. Their words will often hurt. You will want to deny what they’re telling you. But you need to listen to their words. They’re not saying what they’re saying to hurt you. They’re telling you the truth for your good. You need truth-tellers in your life. Cynthia had found a way to deal with her problems. She turned to God. She believed God could help Louie as well. This is why she invited her husband to a Billy Graham (Will Graham) Crusade. She made her requests multiple times. Each time, she was turned down. Until the time she wasn’t. And Louie chose to go to the Billy Graham Crusade. While you may feel your team needs to listen to your first request, the reality is people don’t always respond to the first request. Sometimes not even the second or third. You may have to make multiple requests before action is taken. Louie’s life continued to circle the drain. He was hiding his drinking. He was going behind his wife’s back. And he wasn’t on the right track. Cynthia knew she had to paint a clear picture for Louie. That’s what she did. She asked Louie to look 15 years into the future. She asked him to picture their daughter at 15 years old. Imagine she has brought home her first boyfriend. Imagine being drunk. The stench of alcohol wafting off of his breath. Then imagine how embarrassing he was to his future daughter. The picture Cynthia painted was clear. Louie’s future wasn’t going to be pretty if he continued down the path he was going. You can paint a clear picture like Cynthia. You can vision cast into the future. Examine the current habits of you and your team. Imagine where they’ll lead. Share your insights with those around you. Paint the picture of your organization’s future 15 years from now. Help your team to see how successful or unsuccessful they will be if they continue on their current trajectory. Unbroken: Path To Redemption was a faith-based movie. More so than the Angelina Jolie prequel. This movie made no bones about it. Louie’s life changed when he met Christ at a Billy Graham Crusade. He found a way to forgive and move on from his addictions and the abuse he faced at the hands of Watanabe (David Sakurai). While Unbroken: Path To Redemption was cheesy, it showed the power of transformation. Louie’s story wasn’t fiction. He truly did turn his life around when he found Christ. If you haven’t discovered the life-changing power of Christ, I implore you to consider the sacrifice He gave for you. He laid down His life as a perfect sacrifice for you. Your life won’t be perfect from here on out. It may not even get easier. However, you will have the greatest gift someone can give you living inside of you. For far too long, Louie held onto the bitterness he harbored because of Watanabe’s abuse. He couldn’t let his abuser go. Until he found God. This is when he realized forgiveness was powerful. Forgiveness would set you free. Be willing to forgive those who have done wrong against you. The bitterness you carry isn’t worth the cost of forgiveness. Forgiving those who have treated you poorly, unfairly, and unjustly will not only set them free, forgiveness will set you free. Question: Have you seen Unbroken: Path To Redemption? If so, what leadership lessons did you take away from the movie? 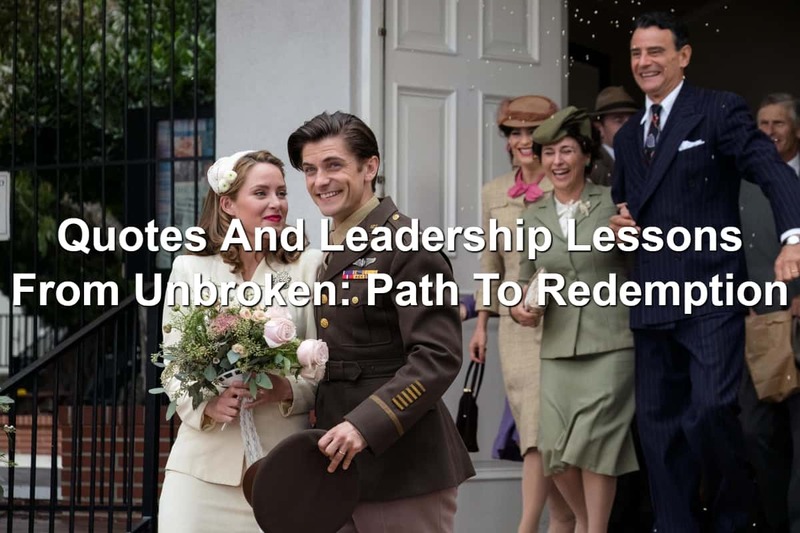 If you haven’t seen the movie, what leadership lessons from Unbroken: Path To Redemption that I shared resonated with you? Let us know in the comment section below.